— My piece Vértigo, recorder by the Ensemble Multilatérale, was a small part of the Spanish Radio show Música Viva, in its program devoted to the 2018 edition of IRCAM’s ManiFeste —where I took part as one of the composers of the Orchestra workshop with Franck Bedrossian, Peter Rundel and L’Orchestre Philharmonique de Radio France/Ulysses Ensemble with my piece IMPACT / TREMORS / SHIFTING. —Interview for the Ensemble Multilatérale YouTube Channel and media feed(s) by Hugo Warinsky. —The New York Times. Anthony Tommasini’s review on Ensemble neonN’s concert on April the 12th. —New York Classical Review. George Grella’s review on Ensemble neoN’s concert on April the 12th. — The New Yorker listing of the concert by Ensemble neoN at Scandinavia House, NYC, on April the 12th 2016. 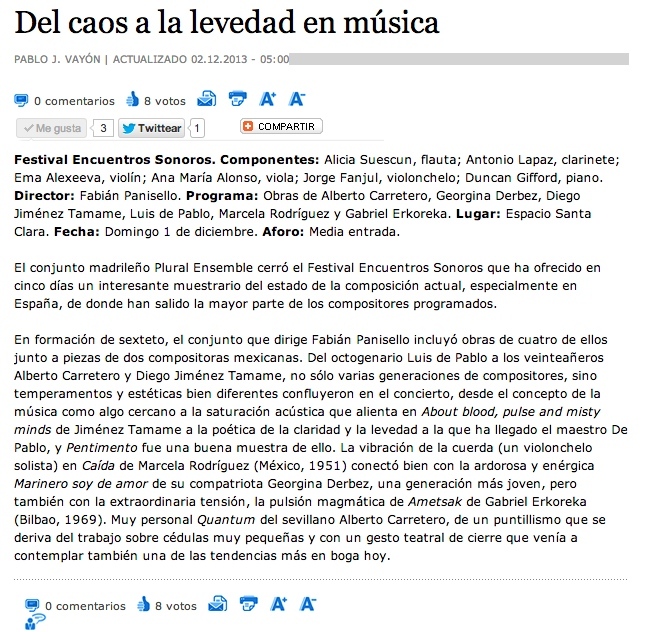 — Review of the concert on July the 18th at Flix’s Church. Sonograma Magazine, Aína Vega Rofes. Diego Jiménez Tamame, per la seva banda, presenta una proposta en què la música entra en combat amb si mateixa per transcendir l’encotillament dels esquemes rítmics, fortament marcats, a Don’t condescend (don’t even disagree). 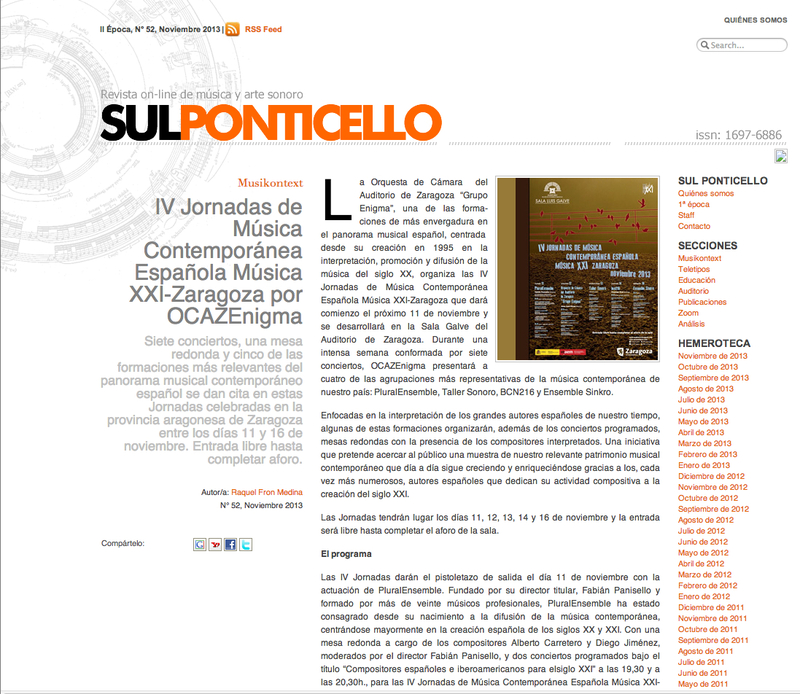 — Inclusion of my list of premieres in the database of the National Center for Documentation of Music and Dance. Click here and type my full name (Diego Jiménez Tamame) in the browser that appears in the bottom of the page. You will find a list of my recent premieres and some interesting details of them.